Want to Beat the Market? Then Stop Trying to Beat the Market! We want clients to have enough money during and through retirement. We want clients to have less stress when it comes to their investments than they would have otherwise. More money/less stress from disregarding the market? Yes! We will explore the second reason, which focuses on the psychology of investing, another time. For now, let’s drive home reason number 1 and show you how and why the slow and steady wins the race…by a mile. According to Curly from City Slickers, the secret to life is “one thing”. He never specifically said what the one thing is, and we certainly won’t address the secret of life here. BUT, we do want to explain the one thing that is the secret to beating markets over the long term. That one thing is…. Many investors do not give much thought about the impact of losses…market goes up, market goes down; many think losses have the same effects as gains. Not so! Substantial losses are devastating to portfolios. It doesn’t matter who you are or how old you are. If you are younger you do have more time to make up for losses, but who wants to see their portfolios deteriorate and have no growth over a decade or two. Obviously if you are closer to retirement or right in the middle of retirement, substantial losses will have major adverse effects on your plans and lifestyle, not to mention your state of mind. As you can see, it takes higher percent gains to compensate for the same percent of losses. Excluded from the chart are gains required to make up for even larger losses. After 70% losses, markets must go up 233% to get back to the pre-loss starting point. After 80% losses, markets must go up 400%. After 90% losses, markets must increase by 900%. What are the odds of market losses that exceed 60% or 70%? Quite good, actually. A bear market is technically defined as a market that goes down at least 20% from a high. Since 1929, there have been 11 notable bear markets. Simple math tells us that a major bear market hits every 8 years or so. They tend to occur more frequently during generational debt reckoning phases, which is what we are currently in. Please see an earlier post that discusses generational or secular economic cycles. (http://navigowealth.com/is-this-a-bull-market-or-bear-market-yes). 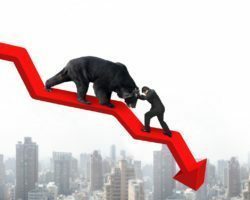 Major bear markets are also stronger when they occur in this environment because of the compounding effects of massive debt on the economy and markets when they start contracting. The prior two bear markets in this current secular phase saw markets decline around 40 percent in 2000 to 2002 and over 55 percent in 2007 to 2009. The final bear market in this phase is usually the strongest bear market by far. In the similar reckoning phase during the Great Depression, the U.S. market decreased by about 86%, top to bottom. During its most recent debt reckoning phase, Japan’s NIKKEI Index declined by almost 83% after its 1989 high. In many other examples, countries have experienced market losses in the 80% to 90% range. Those types of losses are the rule rather than the exception during this reckoning economic phase. Major bear markets will occur relatively frequently, resulting in sizable losses in portfolios that are market dependent. Because of the impact of significant losses, disciplined investment portfolios that remove biases and emotions and emphasize protection as much as growth substantially outperform the market over the long term. Many investors pay too much attention to what the market is doing and focus on matching or beating market returns during any and all time periods. This begs the question, how much bull market participation can actually be sacrificed while minimizing bear market participation to still achieve long term market matching performance? In other words, what are investment performance results when you consider the tradeoff between underperforming in bull markets and outperforming in bear markets. That is tough to quantify, but thanks to Crestmont Research, we have a good idea. Please take a moment to take in this extremely insightful graph based on market returns during the last 50 years. 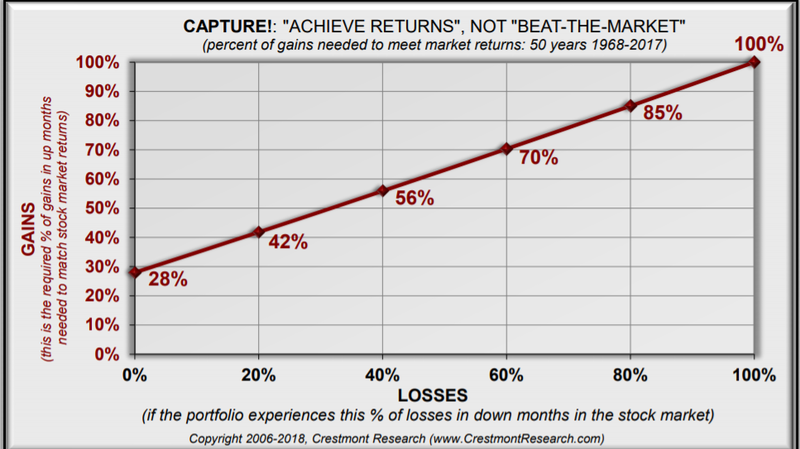 According to this chart, if you absorb 0% of market losses, you only need to capture 28% of market gains to match long term compounded market returns. If you absorb only 40% of market losses, then you only need to achieve 56% of market gains. In other words, cutting your exposure to market losses is much more important than matching market gains. That is our philosophy and should be yours. Imagine what your long term returns would look like if you were to simply absorb 20% of losses and capture 70% of gains, which is well above the “matching the market” line. YOU WOULD BEAT THE MARKET BY A MILE. The stock market is much more volatile than most investors realize. Two volatility gremlins–the disproportionate impact of losses and the friction loss from the dispersion of returns–significantly reduce the compounding of returns. Many absolute return-oriented investment strategies recognize this dynamic and seek to enhance investors’ compounded returns by providing a more risk-managed and consistent return profile. “Capture” is one way to measure and illustrate the effectiveness and benefit of this approach. 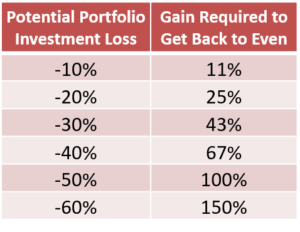 Whereas the ‘relative return’ investor (tracking stock market indexes) will generally experience 100% of the downside and 100% of the upside to achieve market returns, the ‘absolute return’ investor only needs a fraction of the upside when downside losses are limited. The graph above illustrates just how little of the upside is needed to match stock market returns over time and it demonstrates the way that many absolute return strategies exceed stock market returns without having to “beat-the-market” each year. In an industry that is so dependent on investors staying perpetually invested in conventional investments, we say, investors beware! The industry does have an overwhelmingly bullish bias. It depends on bullishness to make money. But what about the credible experts that recommend to just stay in the markets and ride them out? This is a popular recommendation because most of those experts understand how much emotions inevitably come into play. They understand the majority of investors can not be disciplined enough to do anything else successfully. For those that attempt to, it is vitally important to maintain a methodology that is free of emotions and bias at all costs, especially in the heat of battle in strong bull markets and bear markets. In the absence of that framework, he simply says to buy and hold. It’s the next best alternative, albeit a much more dangerous one in this climate. If you can find that proven disciplined methodology, then you will find the slow and steady approach will win every time in the end, with much less stress. If you have a proven methodology that protects your portfolio from major bear markets and positions you for consistent positive returns, stick with it; as boring as it may seem sometimes, it will pay off.